Seaboard USY is proud to stand with our USY friends from across the country and participate in the March for our Lives in Washington D.C. and locations across North America. There are 3 ways for USYers to get involved in what is sure to be a memorable moment of social action. The following day we will travel to the rally together (either on foot or via pre-paid metro card), reuniting afterwards to process what we experienced, before davening Maariv and Havdallah. Shabbat For Our Lives: (Friday, March 23 at B’nai Israel Congregation at 5:45 PM) Can’t make it for the whole Shabbat experience? Join us for Friday night dinner! Gather alongside more than 750 Jewish teens, from across the country, for a powerful Kabbalat Shabbat service, nationally renowned guest speakers and Shabbat dinner. In partnership with BBYO, this event is open to any and every Jewish teen participating in the March for Our Lives – those from Greater Washington and those visiting. This event is free to all participating thanks to the generous support of USY’s partners in the Jewish community. Click here to save a seat. Space is limited, and this event will sell-out. This event is for teens only. 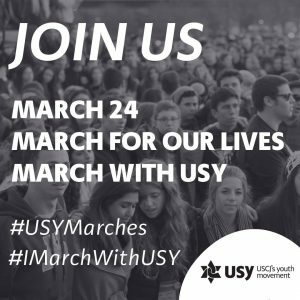 March for Our Lives ‘Meet-Up’: (Saturday, March 24 at Farragut Square Park (912 17th St NW) at 10:30 AM) USY has arranged for a pre-March ‘meet-up’ and allow for a check-in space for those who need directions, a place to pause, or to connect with others. You can also find others to join the March with from this spot. 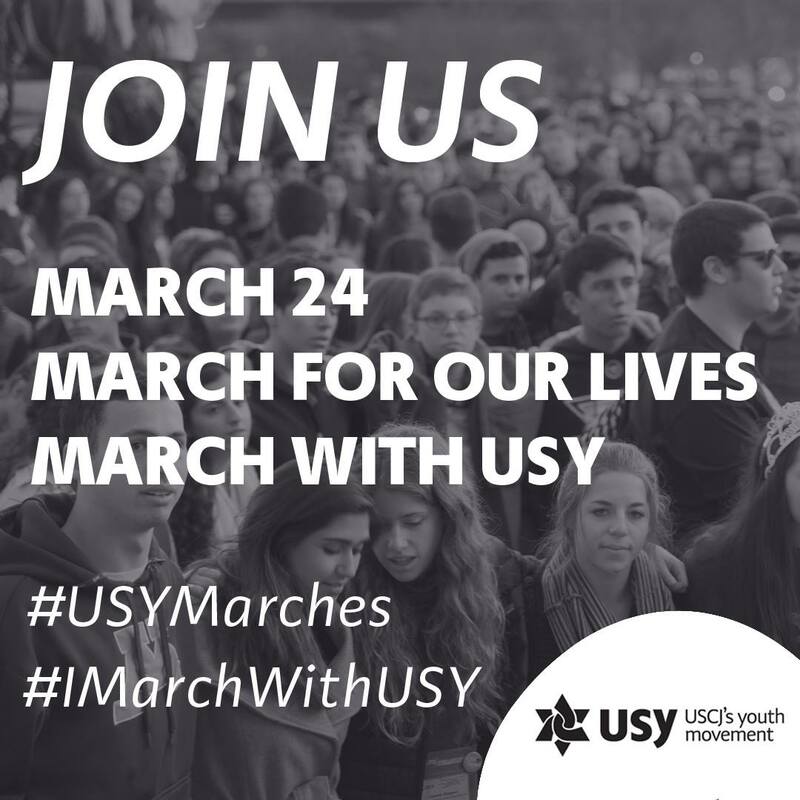 This meet-up is open to all those in the USY family: members, parents, alumni, advisors – as well as any and every Jewish teen that wants to join us! USY is proud to be providing the experience free of charge (USY is asking that each participant makes a $36 donation to the USY Tikun Olam Tzedakah fund in lieu of registration fees). In order to do that, we need to raise funds to support the event. Please share our donate link with your networks, and refer any interested donors either to the link www.uscj.org/donate/usy/marchforourlives/ or to our Director of Alumni Affairs, Matan Silberstein (silb...@uscj.org). For more information, please contact Seaboard Regional Teen Engagement Director, Sasha Bloch (blo...@uscj.org).